32 more levels, all just like you like 'em. It's been uploaded to idgames/ and is also available on Compuserve and Fidonet. We're following along in the grand tradition of Bloodlands and Grievance, with another 32 level set, same play rules as before, and we've got some levels in here that are without a doubt our best yet. Take a look at the "Rules of the Game" section over to the right if you're not familiar with the TeamTNT standard way of using DM skills. As before, we're not just taking a bunch of levels and throwing them together for you. These are all-new levels, specifically designed for this project. Can't beat that. As in Bloodlands, we've put together 32 levels of pure 100% Deathmatch, no monsters to get in your way. The same approach to game rules (using skill settings) that we used in Bloodlands have been used in Grievance too, and there will be Fragfests galore. Other things that we learned that people like about Bloodlands will be done too, like having an identifiable exit door and switch on every level so you don't accidentally leave before your own funeral. Take a look below at the details, under our Bloodlands section..
Time for some serious mayhem? TeamTNT gave you attention to deathmatch in all 32 levels of Icarus, but there's no substitute for dedication. 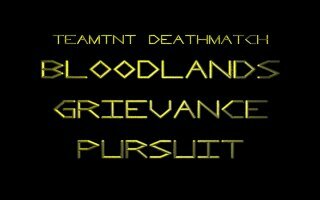 In Bloodlands, we've made every level purely for deathmatch. There's not a monster in sight--just your "buddies." Most of the levels are small enough that it'll be a fragfest with two, mayhem with more. Sometimes you'll find yourself deciding strategy, but most of the time you'll find yourself dead.